I really wanted to come up with a cute name for this cake. Something like, Perfectly Pistachio Cake or St. Patrick’s Pistachio Cake or something much more exciting than those two options. I’m horrible with coming up with recipe titles. 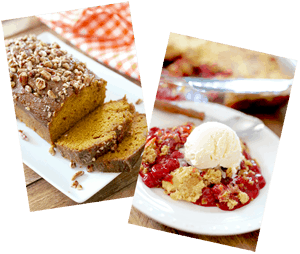 There are all kinds of neat looking recipes with cute and catchy names. 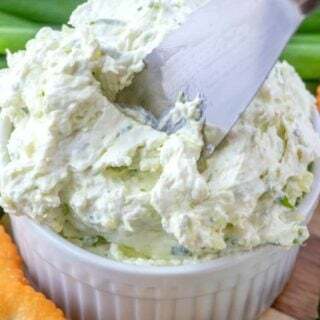 Have you ever noticed that lots of the popular recipes start off with the word “Crack.” You got your Crack Potatoes, your Crack Weenies (yes, I actually saw a recipe called Crack Weenies) and your Crack Bread. Maybe I should have called this Crack Pistachio Cake. 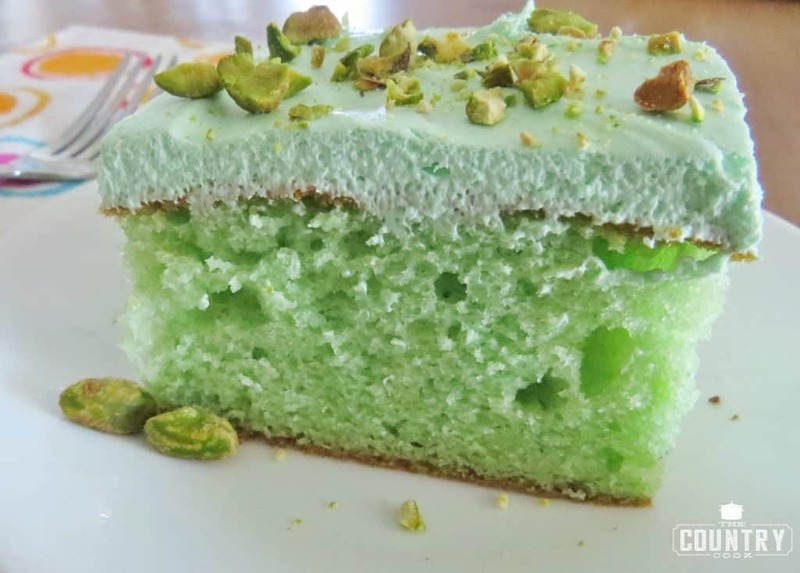 This particular cake has a very mild pistachio flavor. To me, pistachios have a very light flavor, kinda like almonds. They aren’t a very nutty nut. If ya know what I mean. The raw nut itself almost tastes sweet. I like them raw but I know a lot of folks may prefer them roasted and salted. The green color makes it kinda perfect for St. Patrick’s Day. I tend to make a lot of mint flavored goodies for this particular fun holiday but I wanted to go outside my usual mint treats. And when I was thinking green, pistachio is what popped up first. Even my non-nut loving brood enjoyed this one. Hey, it’s green, what’s not to love?? Note: many pistachios puddings have very tiny chunks of pistachios added to the mix so please skip this recipe all together if there are any nut allergies. Preheat oven to 350F degrees. 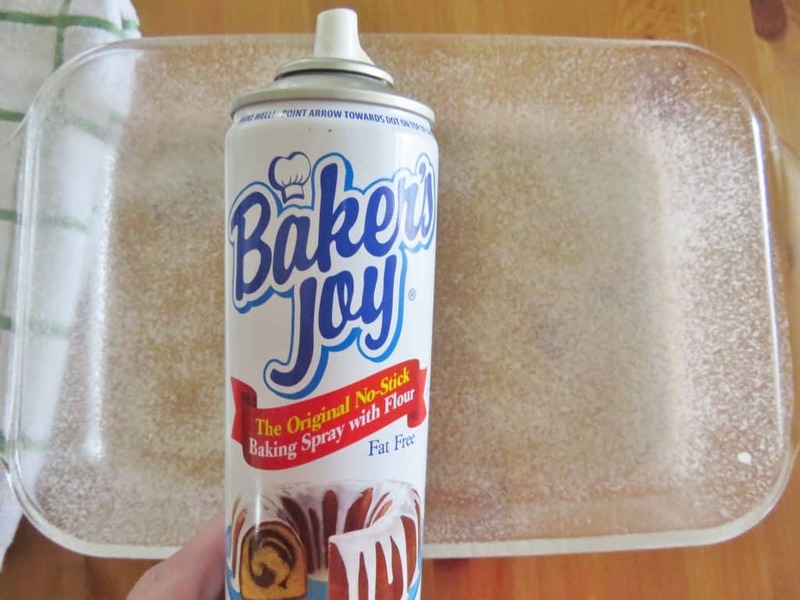 Spray a 9×13 baking dish with nonstick spray. 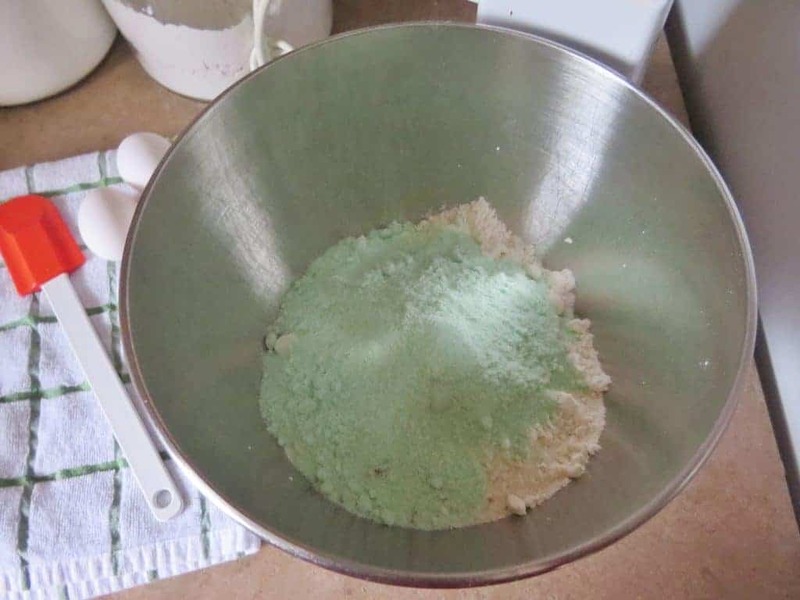 In a medium bowl, combine dry cake mix with dry instant pistachio pudding. Mix those together until combined. Stir just until combined. 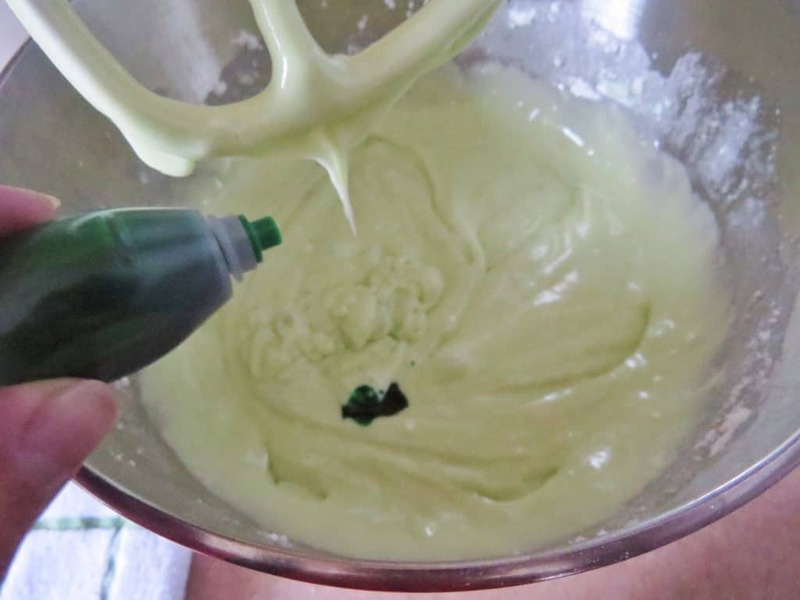 This next part is optional but I like to make this cake a bit more green. 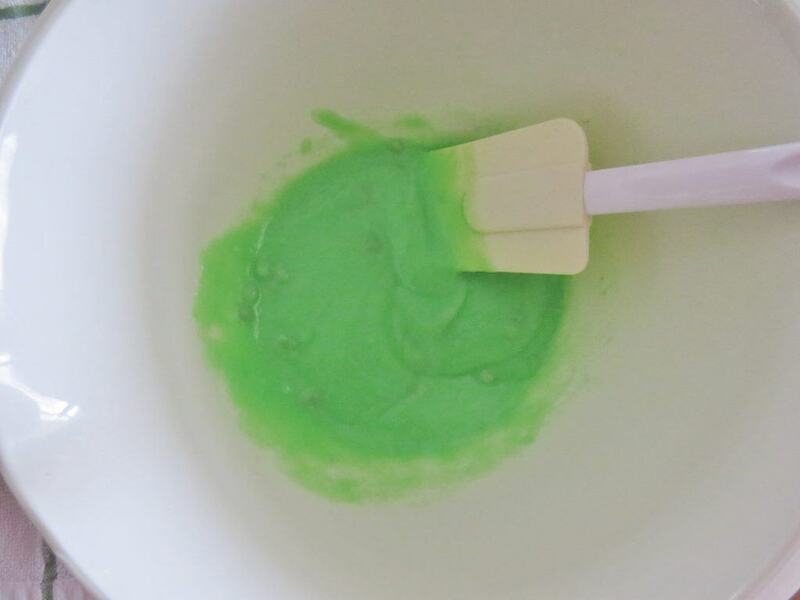 I add in a few drops of green food coloring. About 6 to 8 drops. It just depends on how green you would like it. 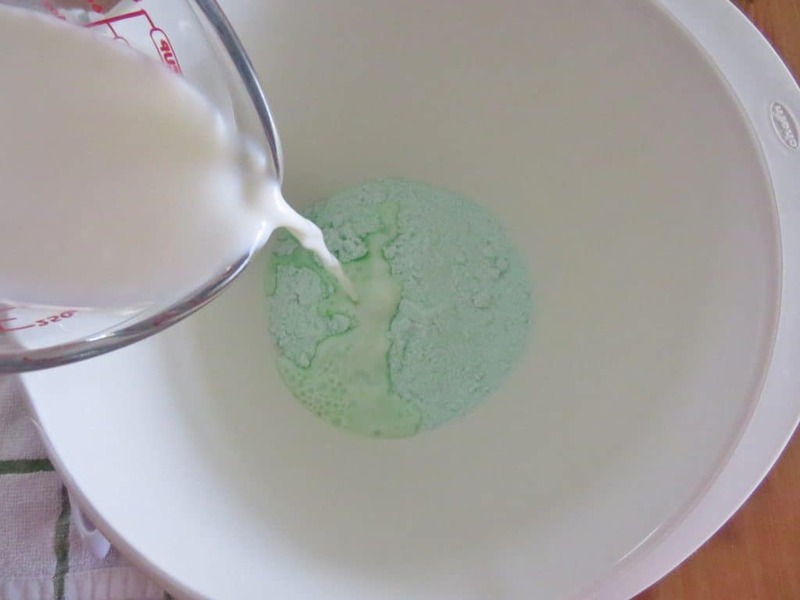 Stir until the food coloring is totally incorporated. Check around the 25 minute mark. If you insert a toothpick into it, it should come out clean when done. Now, it will look brown when you take it out. Don’t panic, that’s why I show you these step-by-step pictures. 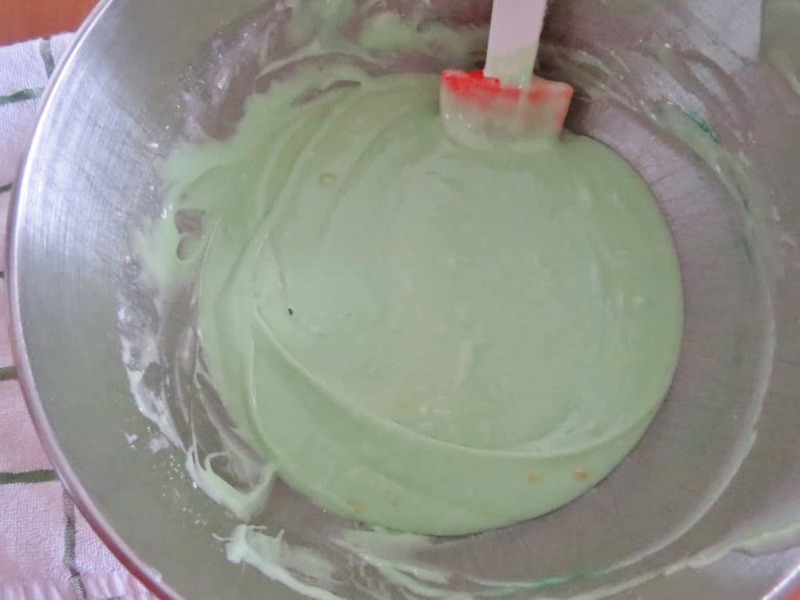 It is green inside and the frosting is gonna cover that top anyway. 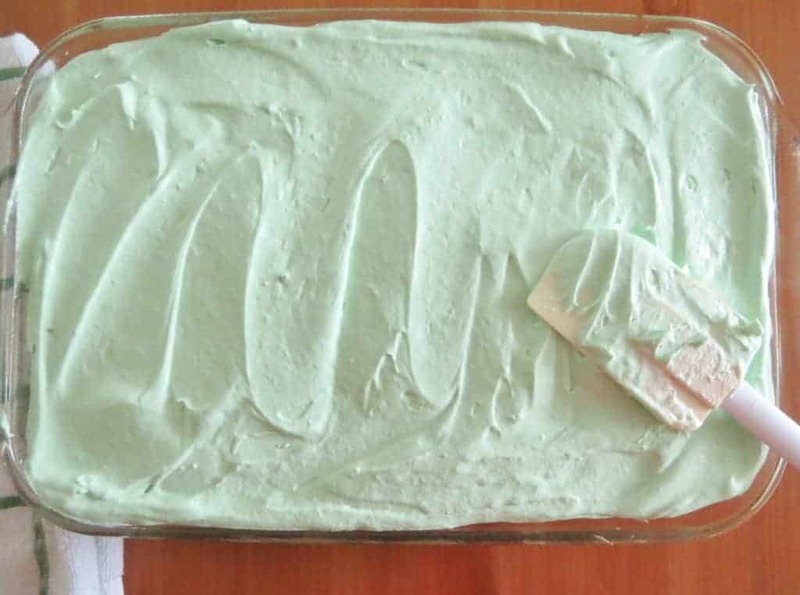 Allow cake to cool completely before making frosting. 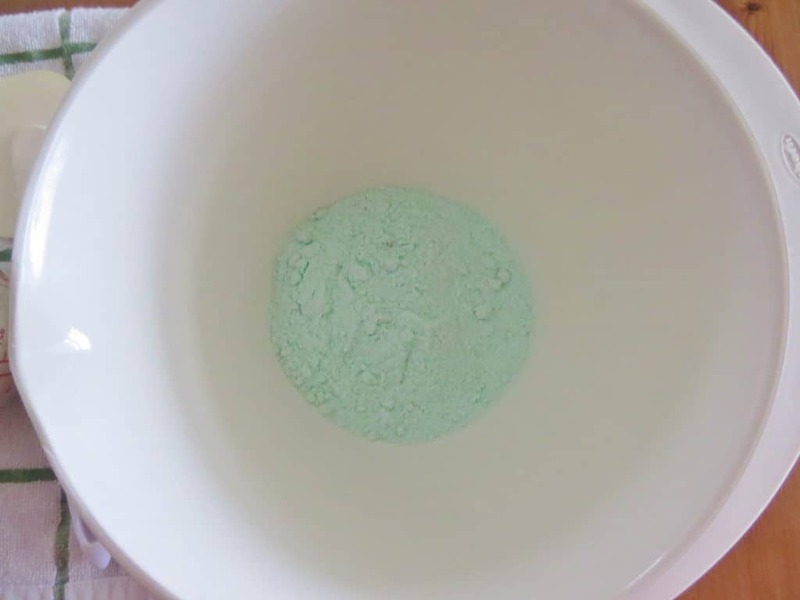 Once again, I put in a few drops of green food coloring to really bring out that green color. About 5 drops or so. 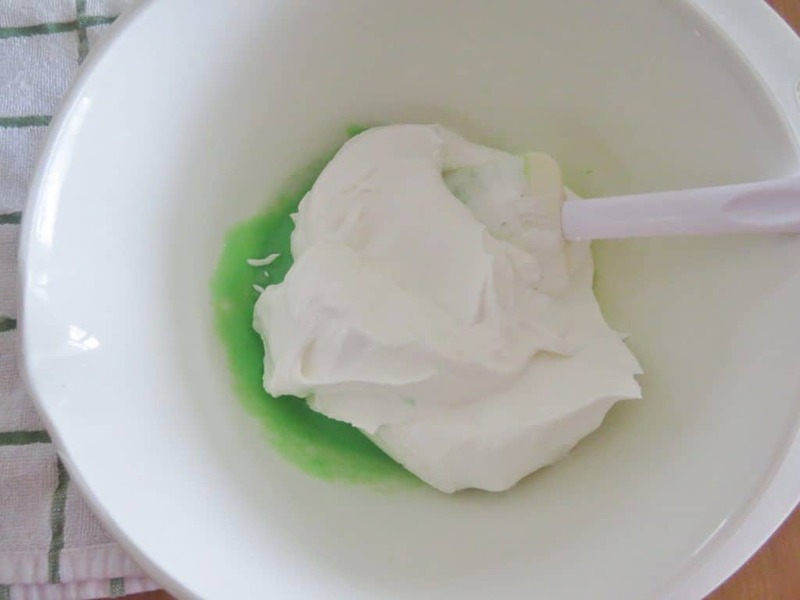 Spread frosting onto cooled cake. If you didn’t let the cake cool completely, the frosting is just gonna melt into cake. And no one wants that! Slice and serve. If you like, sprinkle with some crushed pistachios. This cake needs to be kept refrigerated. 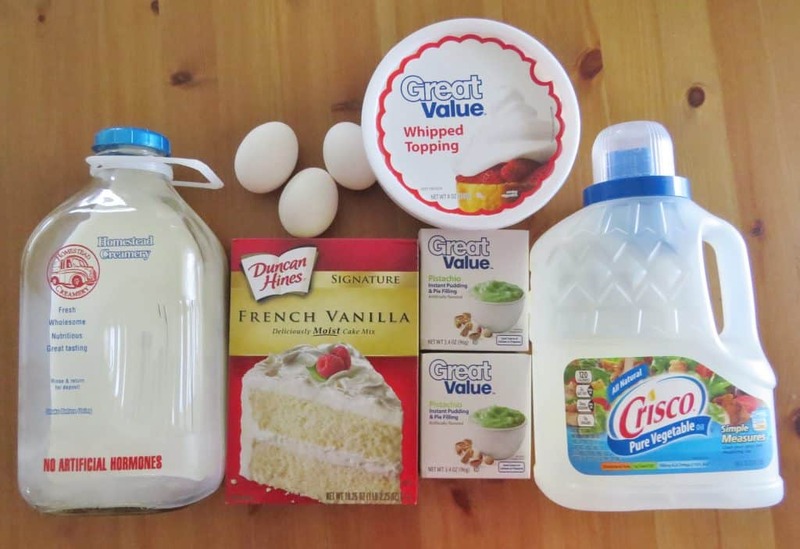 Can you make this cake ahead of time? I want to make it on Thursday and serve on Saturday night. Having to travel with it. Just made this cake and it came out great! I followed recipe that was posted.Very moist and pretty! Great for St.Patricks day! Thank you for sharing! Will make again! Would this rate good with cream cheese frosting? 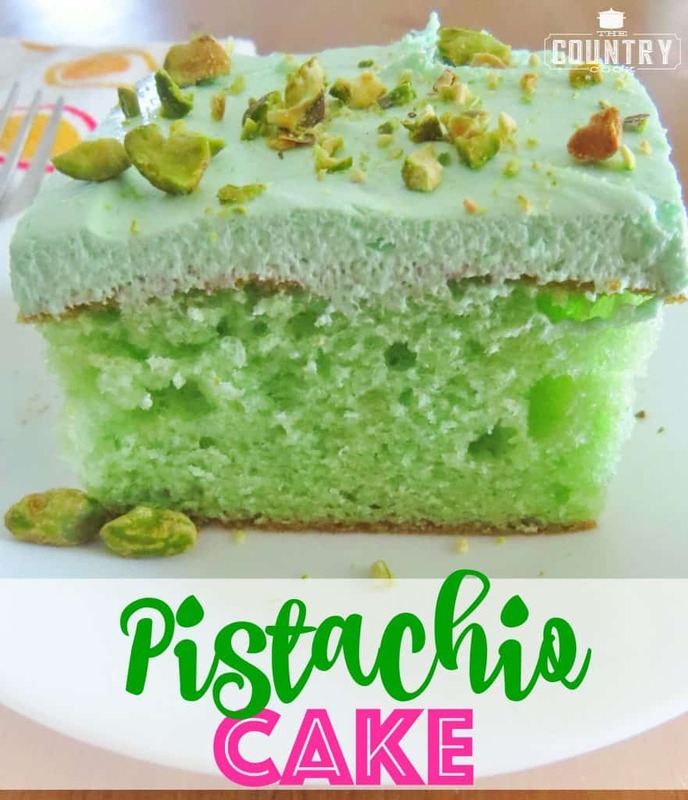 I would go with Pistachio Perfection Cake as a name. I also added a couple of drop of pistachio extract to the cake mix, just give the flavor a bit more umph *as my grandma would say). The augmented flavor was well worth the experiment of using the extract. My whole family loves pistachio so I made this for my mothers birthday , and it was a hit! 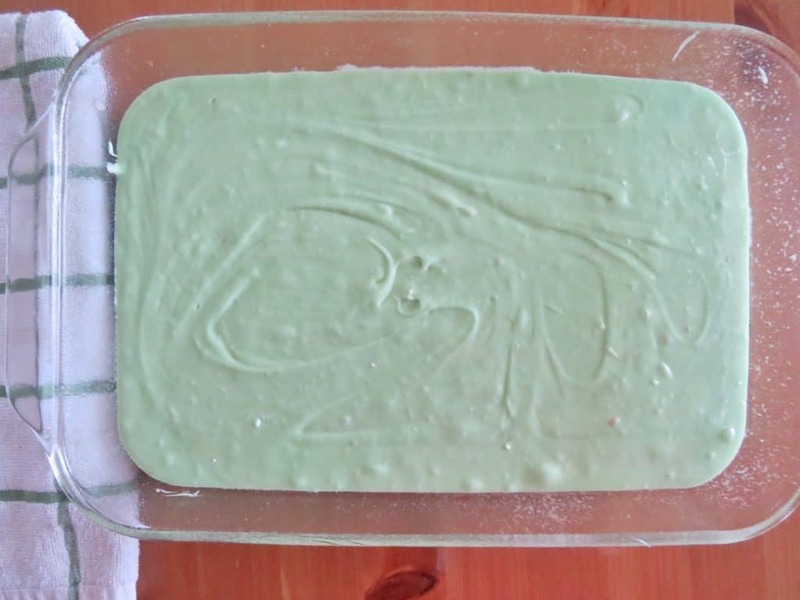 Additionally, I actually made it into a poke cake as well using pistachio pudding! Pistachio overload? I think not!! 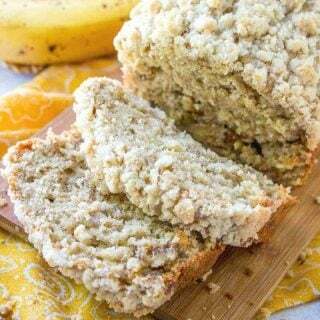 Thanks for this fabulous recipe, will definitely be making it again and again! 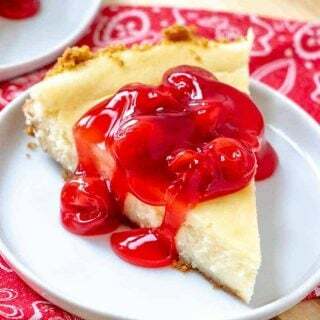 Hi I would like to make this recipe but in cupcakes, how long do I bake it for? I had to sub cheesecake pudding mix in the frosting. 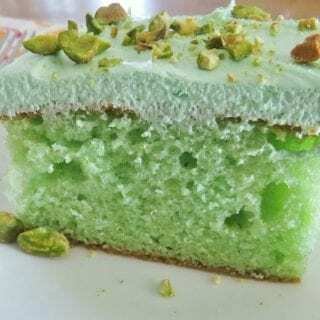 I added green food coloring & crushed pistachio nuts to frosting. I made cup cakes and everything tasted great..
instead of using boxed cake mix, can I use a standard white cake recipe from scratch? Then add all the other ingredients as you have listed them? Excellent cake – made it for our St. Patrick’s Day potluck dinner. It was a hit! 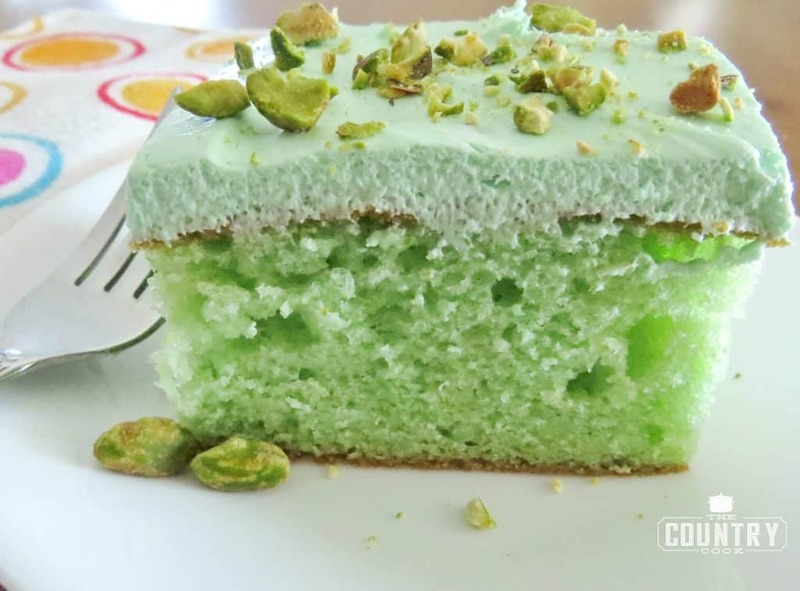 So moist and full of Pistachio flavor. Not sure why the comments about “poke”…. 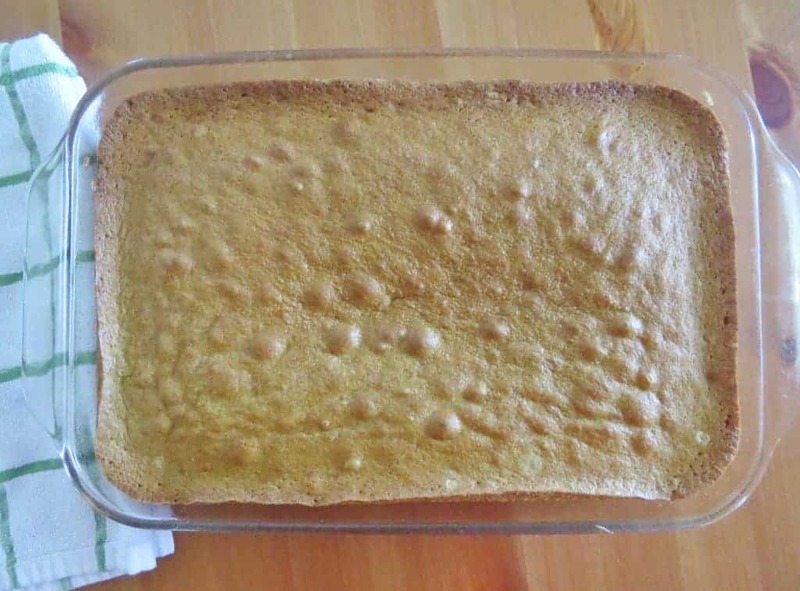 this is not a poke cake. 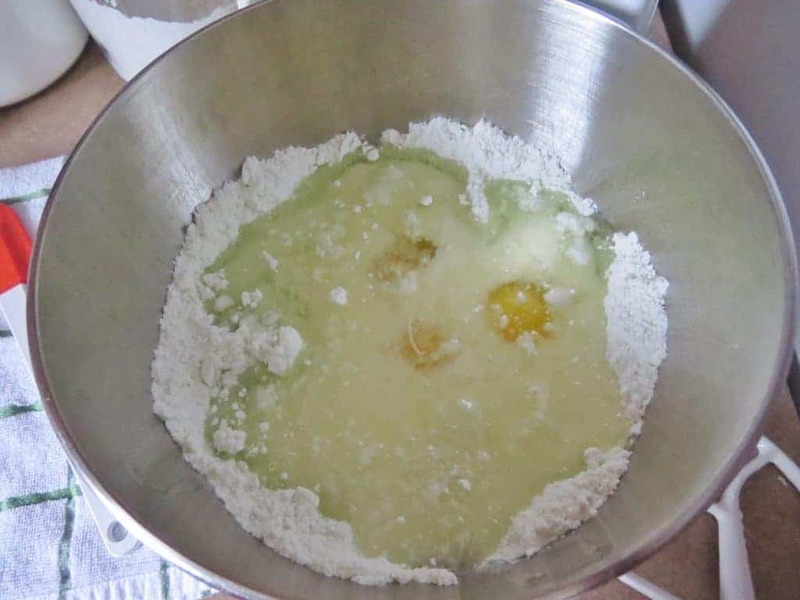 The dry pudding goes into the cake mix. 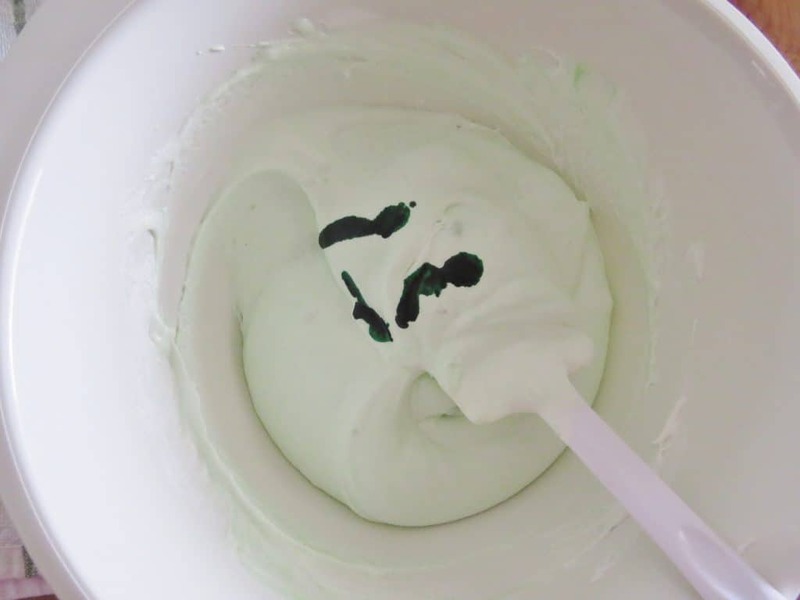 Loved the frosting too – great idea to add pudding to the Cool Whip. HI Elisa, it obviously need a bit longer. I’m sorry! Some ovens run hot (and some not!) Was it on the top shelf or bottom? If your oven seems to bake slow, sometimes it helps to put things on an upper rack. You also may want to check the *actual* temperature of your oven. You can purchase an oven-safe thermometer for fairly cheap. Put it in the center rack of your oven. Then, preheat your oven to 350f degrees. Once your oven says it has reached that temperature, check your oven thermometer and see if they match up. Most ovens run a bit hot or slightly cool. That will help you adjust future recipes accordingly. Hope that helps!! 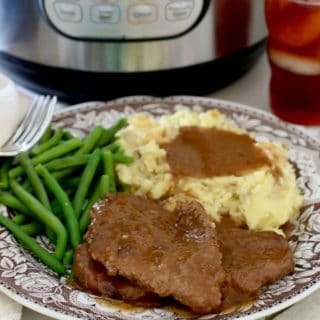 hi, I would like to print this recipe. I pulled it up and hit print but nothing happened. Help! Hi Carol….hmmm. I just had a few folks test it for me and it’s working for them and for myself. I’m honestly not sure. Do you have pop-ups blocked on your device and is your printer on and full of paper? It’s really hard to know since I’m not there with you to see everything. I’m sorry! 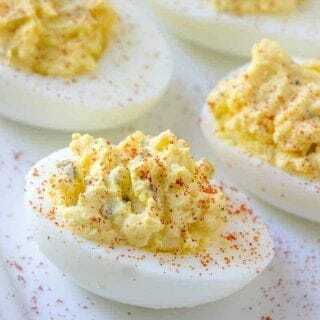 Can you make this recipe with two rounds ? Hi Beth, I don’t see why not! 🙂 You’ll just need to keep an eye on baking time. You sure can! Not more than a day or two ahead and make sure to keep it refrigerated. My pistachio pudding is sugar free and fat free, will that work? Or do I need to find just regular instant? Thanks! Hi Eva, I honestly have never made it with that. I suppose if you enjoy fat free and sugar free pudding, it should be okay.